The Zebra CS4070 barcode scanner connects to your iPad via Bluetooth and allows you to scan your items wirelessly. It also supports all barcode types. NOTE: To scan the barcodes included in the setup instructions below, you can either print or scan them from your iPad screen. If you choose to print the barcodes, please be sure to not stretch them as it will render them unscannable. The barcodes are also available in your Zebra CS4070 Scanner Product Reference Guide. Insert the lithium-ion battery bottom first into the back of your scanner. Connect the micro USB end of the micro USB host cable into the micro USB port at the bottom of your scanner. Connect the USB end of the micro USB host cable into the USB port of your computer or power adapter. Charge you scanner until all 4 green battery level LEDs are lit. With a fully discharged battery, this usually takes about 3 hours. Press the scan key (+) to wake the scanner. By default, your Zebra scanner is set to HID keyboard mode. In order to use the scanner with your iPad, you must set the scanner to Bluetooth MFi_SSI mode. To do so, scan the Bluetooth MFi_SSI barcode below. The barcode is also available in your Zebra CS4070 Scanner Product Reference Guide. If the Bluetooth LED doesn't begin to blink quickly to indicate its in discoverable mode, press and hold the Bluetooth key on the scanner until it beeps. On your iPad, open your Settings. On the right-hand side, enable the Bluetooth toggle (if it's off). Under OTHER DEVICES, tap your CS4070 scanner to initiate pairing. The Bluetooth LED blinks slowly to indicate the scanner is paired with the iPad. You scanner also displays as Connected under MY DEVICES in your iPad's Bluetooth settings. NOTE: Bluetooth pairing suspends temporarily while charging via a USB cable. Disconnecting the cable re-establishes Bluetooth pairing. You can also disable the beeper functionality by holding down the scan key (+) for 10 seconds. From the main menu, make sure the scanner icon's hardware status is green. Optionally, tap the scanner icon to see your scanner's model number listed in your Device Settings. Point your scanner towards an item's barcode and press the scan key (+). Your item should be added to your sale confirming that you've successfully set up your scanner! If your scanner is unused for a short period of time, simply press the scan key (+) once quickly before scanning an item. If your scanner is unused for an extended period of time, it will go into sleep mode, you'll hear it beep and its Bluetooth LED will stop blinking. To wake it from sleep mode, simply press the Bluetooth key once quickly. This reconnects it to your iPad and Retail POS app. Press once (quickly) Scanner reconnects to your iPad and Retail POS app. Press and hold for 2 seconds Scanner's Bluetooth disables and temporarily unpairs from your iPad and Retail POS app. Press and hold for 5 seconds (until beeps) Scanner completely unpairs from your iPad and Retail POS app and enters discovery mode. The blue Bluetooth LED light also blinks rapidly. 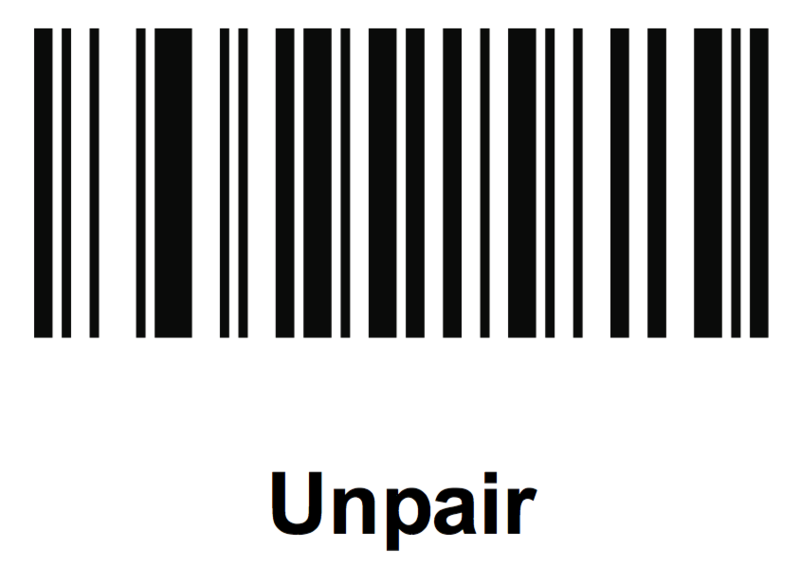 To unpair your scanner from your iPad, scan the Unpair barcode below. The barcode is also available in your Zebra CS4070 Scanner Product Reference Guide. Unpair your scanner from your iPad. 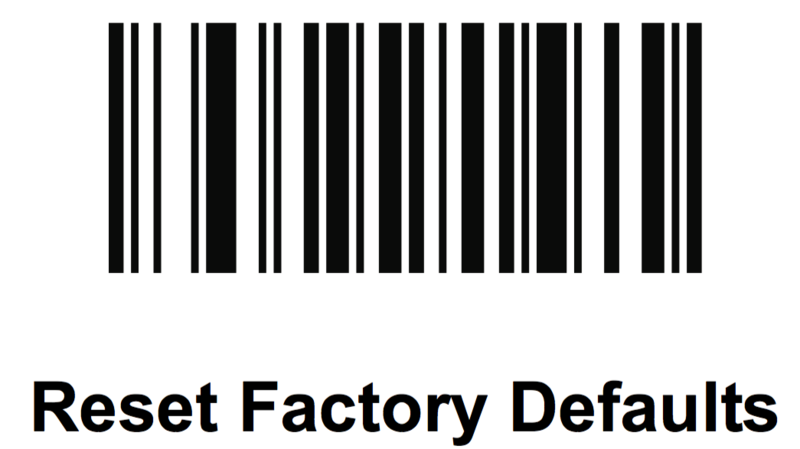 Scan the Reset Factory Defaults barcode below. The barcode is also available in your Zebra CS4070 Scanner Product Reference Guide. Follow section 2. Pairing your scanner with your iPad and 3. Testing your scanner in Retail POS to set up your scanner again.